This document addresses queries around server behaviors, the Bindings panel, and databases in Dreamweaver CC released on June 18 2013. In Dreamweaver CC, server behaviors are available as an extension, Deprecated_ServerBehaviorsPanel_Support.zxp. After you install the extension, the server behaviors feature is enabled and extensions dependent on it work as they did previously. In the CC release, based on your OS, you can find the extension at the locations below. MXP type extensions are not supported in Extension Manager CC. The MXP format has been replaced with the ZXP extension format. An MXP extension can be converted to a ZXP extension using the “Convert MXP Extension To ZXP” tool. This tool can be found in the Tools menu in Extension Manager for CS6. DSM5.0-4482 (or newer is installed) for your particular DS. DSM4.3-3827 for your particular DS. A network and some cables. A disk to be used for installation. Your data, back up a safe place. as a system routing table management daemon such as routed(8), should tend to this task. 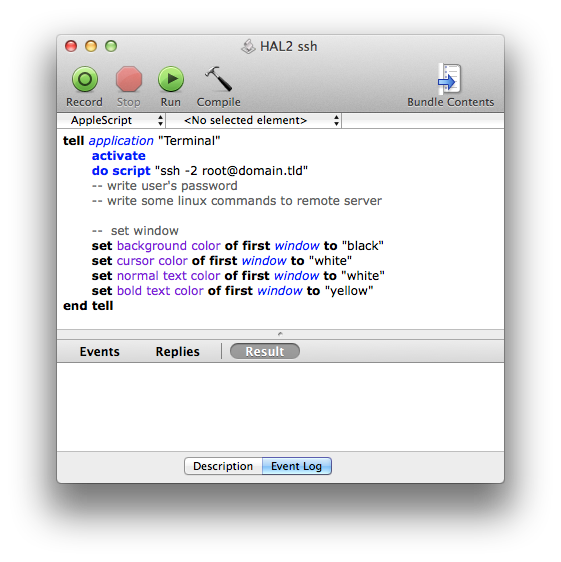 do script "ssh -2 [email protected]"